David Jones offers an unparalleled portfolio of local and international brands you know, love and respect. The David Jones eGift Card can be used across fashion, beauty, home, electrical and fine food of which many brands are available at no other department store. 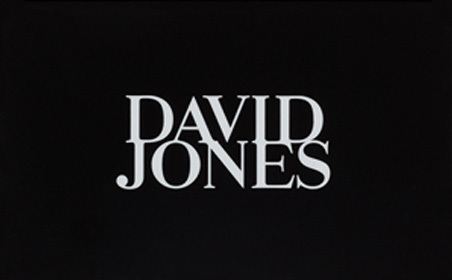 David Jones eGift Cards can be used to make purchases at davidjones.com.au or in any of our stores located throughout Australia, and are valid for 36 months. Prezzee’s Instant David Jones Gift Card. Shopping for a David Jones Gift Card has never been eezzee-ier than with Prezzee. Choosing from among our hundreds of retailers and department stores like a David Jones Gift Card gives your recipient the gift of shopping. They’ll be sure to love your next present, able to select exactly what they want from David Jones’ extensive range of products. Your David Jones Gift Card is redeemable nationwide in store or online. With Prezzee, you send your gift directly to your giftee’s smart phone which means they’ll never lose or leave the house with it again. There’s no waiting for the post – or possibility of losing it in the mail – and you pay no delivery fees. You can even include an e-greeting card with your present for that personal touch.